How Sweet It Is: Mooyah Is In McKinney Texas! It is a fun, inexpensive, yummy place to eat with the whole family. And guess what? You can win a $15 Mooyah gift card to try it out yourself. Become a Google follower ((2 entries)) Make sure you comment on this post two different times. Once my facebook page hits 100 likes I will draw the winner. Only people living in the contiguous United States are eligible. The winner will be notified via email and his/her card will be mailed to them. 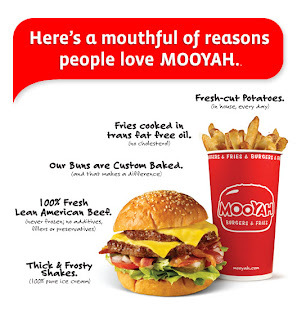 I've never been to Mooyah, but hear it's delicious! I would like to try the Oreo Shake!